5.10 points at 10 votes (rank 769). Many programme languages use binary data commands. But these are not easy to see through for everyone. Hyper Aggressive picks up this topic an makes the player work with ORA, EOR and AND. It is a puzzle game that creates sensitivity for this counting system with special bit commands. In the main part of the game, you have to set fields of your own colour faster to 1 than the opponent for his colour. For this masks appear, with which both players in turns change the numbers on the fields according to the corresponding rules. The game offers the possibility to play against the computer or a human opponent and have exciting fights. Already the intro offers a nice animation which creates atmosphere. 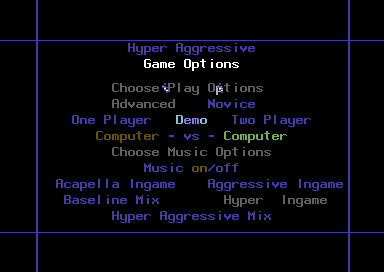 Also in the options menu is lots of movement. The game uses only few colours, which are grey, blue and red. 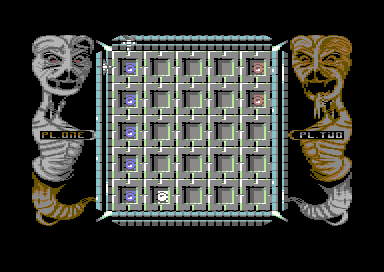 In the tower round the two players are displayed as two monsters in contrary colours that frame the game area. Sound effects fit the happening in the game. There are jingles at the start and at the end of the field round. The background music, which runs during playing, can be chosen from five different versions. After the intro you get into the options menu by pressing the fire button. Here you can set the difficulty grade to „Novice“ or „Advanced“. Further below you decide whether you want to have music in the game and which of the five versions you want to hear in the field round. As a last step you set against whom you want to play (computer or second player) or if you rather want to see a demo. With picking this choice you start the game. 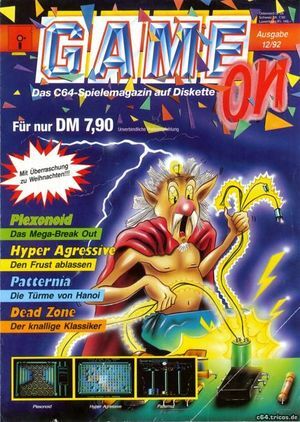 The demo can be aborted py pressing the fire button. ... end of the game, a row of 5 has been reached in the tower round. Player 1 wins. The game always starts with a tower round. On the area of 5x5 fields every players picks a field that he wants to occupy. The aim of the game is to reach a row of 5 occupied fields faster than the opponent. The row can run horizontally, vertically and diagonally. Both opponents can also pick the same field. If you have made a mistake and picked the wrong field you cannot correct this. The one who wins the following field round will then occupy his chosen field and it gets the corresponding colour of the player (player 1 blue, player 2 red). After choosing the field in the tower round the field round starts, which is the main part of the game. In the field round an area of 10 x 18 fields appears. Each of the 180 fields contains either a 0, a 1, a blank field or a depression. Only the fields with 0 and 1 can be used, the other have no further importance. In the basis the complete field is grey. Two new shapes are laid over this, one in blue (player 1) and one in red (player 2). For each player now the values of his colour are of importance. You need to turn the zeros in your own colour to ones as fast as possible, which is before the opponent has done this for his colour. The shapes can overlap which makes the game a bit more difficult. 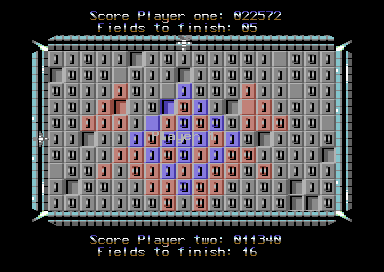 The number of fields in the corresponding colour which are still set to „zero“ and the points for player 1 are shown above the game area. For player 2 this information is shown below the game area. If it is a player's turn, his coloured shape comes to the foreground and flashes. If there are overlaps, this makes the own area fully visible. After pressing the fire button the mask for the player appears. To change your zeros to ones you have to use the provided mask, which appears when it is your turn. A mask consists of a square of 3x3 fields and can contain zeros and ones. Summary: With ORA you cannot create zeros and with this are not able to destroy anything at the opponent's area. Therefore this should be used to get the own fields to 1, especially at places where there are already ones in the surrounding and which should not be destroyed. Summary: With EOR you can easily create ones and at the same time make zeros next to them. Therefore a bit dangerous as you do not always know what lies behind a ??? and you run a risk of ruining your own balance. You better use it a the borders of your own area and possibly offers you to create a 1 in your own field and at the same time create a zero field for the opponent in a field lying close. Summary: With AND you cannot create ones and with this do not make any progress in your own area towards the victory. AND is very suitable for making the opposing fields to zeros and this way get a little advantage. Beware: Behind a ??? all of the three named rules can hide, therefore you take a risk here when using it. The player who has first eliminated all zeros from his area wins the round and with this the chosen field in the tower. If the last move sets the number of zeros for both colours to zero, the ones wins the round that has made this last move. After that you see the score (see section „Points“), whereupon you change back to the tower round. Here the result of the last „fight“ is transfered and another choice of fields can be done, if none of the players has reached a row of five yet. The game can be played with the joystick in both ports, but both players use the same port. Both in the settings and in the tower and field round the marking or the mask are steered with the joystick into the corresponding direction. In the field round, the correct placing of the mask is confirmed with the fire button and the changes are done. With the fire button you also confirm the settings before the game and the game is continued after the score was shown. Although there are points for many things, the score is of no meaning concerning the victory. This of course raises the question why there are any points at all, because the winner is always the player that has first created a row of five in the tower round. Change a field: depending in the mask there are points in the single-digit area when changing a field. For fields in the grey area you get only points, if you set them to 1. Sometimes a level is very unfair concerning the allocation of the zeros, the sizes of the coloured areas or the masks that appear (repeated appearing of the same useless mask). Here the only things that help are a good strategy and being mean to the opponent. In any case, the computer opponent seems to know what hides behind a ???. No cheats are known for this game. Camailleon: "An inconspicious game, that hast got the lot. You practically have to take in the rules for ORA, EOR and AND to reach your target. The game can teach you very well the rules through „Learning by doing“. After a several tries I had got the knack, although I had never seen a piece of code. The whole game runs fluently, the game are is clearly laid out and not overloaded. It is very exciting in the two-player mode and against the „Advanced“ computer opponent. Unfortunately, the levels are sometimes unfair, which is relativised by the fact that one lost round does not mean that the whole game is lost. " On the title screen of the corresponding Game On cover there is a mistake in the games name, a "g" is missing. 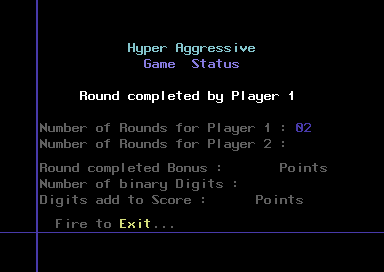 There are points for almost everything, but neither an end score display nor a highscore list. This is actually no wonder, as the aim is, to make a row of five faster than the opponent in the tower round. The better the opponent, the more rounds you may have to win and therefore you will reach more points. Therefore a highscore list does not make sense in this game.